Twitter has pulled an account which claims to enforce the Olympics' Rule 40, which prevents non-sponsors from hijacking Rio 2016. 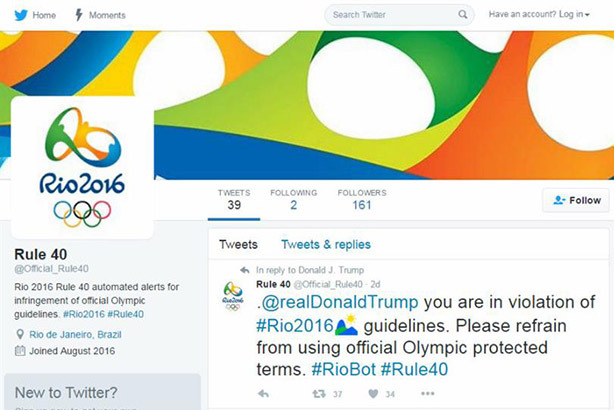 The self-proclaimed bot is a fake, but has garnered attention after telling off various brands and celebrities including the Pope, 10 Downing Street and Donald Trump for using the official #Rio2016 hashtag on Twitter. One of several giveaways that @official_rule40 is a fake is the fact that Twitter has more than 200 official hashtags and emojis related to the Olympics, all of which are free to be tweeted by users. And though the account claims official status, it is not a verified account, nor does it actually explain what Rule 40 entails. Twitter has listed key official Olympics accounts on a blog and verified them. The bot also didn’t target every user tweeting the #Rio2016 hashtag, instead focusing primarily on brands and celebrities. That the account is clearly fake did not stop users from falling for the prank. Twitter would not comment on the suspension but it is, ironically, likely that the account itself is in violation of Olympic brand guidelines by pretending to be associated with the Games. Tim Crow, chief executive of Synergy Sponsorship, said this might reflect poor public perception of the International Olympics Committee – but added he did not think the IOC would be so petty. "The last thing the [official] sponsors would want would be to do something like this – they want people to feel part of it," he said. "[Rule 40] is about catching campaigns." Even then, the IOC is unlikely to come down hard on offenders, Crow said. He pointed to a case in Australia, where non-sponsor Telstra won a court case brought by the Australian IOC for its "I go to Rio" campaign. "As soon as you do that, it becomes a much bigger story," he said. "And they lost – that tends to happen more often than not."